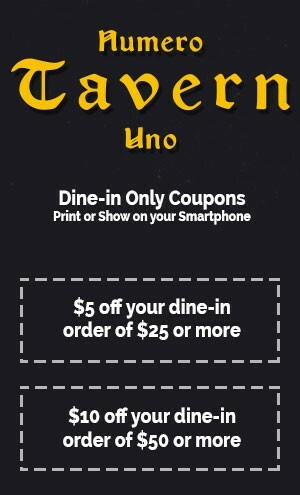 Welcome to Numero Uno Tavern! We have our traditional Numero Uno deep dish signature pizzas along with our new bar with 18 craft beers and wines. Come in Monday thru Friday from 3-7PM for our happy hour menu! Come in, have a drink and your favorite Numero Uno dish and watch your favorite team on one of our 8 HDTV's at the Numero Uno Tavern! We'll be looking forward to seeing you soon!